LG has been teasing that "a new series will be unveiled" at Mobile World Congress 2013, but its new lineup of LG Optimus L series smartphones couldn't wait until Barcelona to be unveiled. Specifically, the LG Optimus L7 II and LG Optimus L5 II specs have been leaked twice over, by a benchmarking database and a Korean-language blog. LG Optimus L7 II, which goes by model number LG P715 in the database, has the following specs: a 1GHz dual-core processor and Snapdragon S4 Play system on a chip. This sequel to the LG Optimus 7 is backed up by Adreno 203 graphics, 768MB of RAM, and a 2460mAh battery. 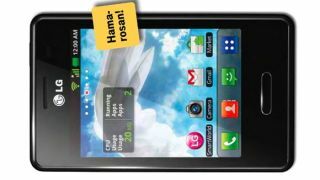 The LG L7 II will run Android 4.1.2: Jelly Bean on the inside, while the outside will sport a 4.3-inch WVGA (800 × 480) touchscreen and 8MP camera, according to the specs-filled database. The Optimus L5 II will also be powered by Android 4.1.2 Jelly Bean, but its system will be a single-core 1GHz MediaTek MT6575 chip with PowerVR SGX 531 graphics. The benchmark database doesn't include screen dimensions, but the Korean blog points to a slightly smaller 4-inch display at 800 x 480 pixels. Specs for the entry-level Optimus L3 II weren't leaked by the same stat-heavy benchmarking website, but its details are laid out in full color by a T-Mobile Hungary advertisement that jumped the gun. The L3 II is an Android smartphone that continues the shrinking screen size trend with a smaller 3.2-inch QVGA screen at 240 x 320 pixels. This no-frills budget model is supposed to have a 5MP camera on the back and include Bluetooth, WLAN and A-GPS. LG didn't get back to TechRadar to confirm any of the leaked specs, so this just adds to the list of what to expect from Mobile World Congress 2013 beginning on Feb. 25.